PMP (Pocket Money Polishes) is one of the newer BRITISH Indie Polishes on the Block. 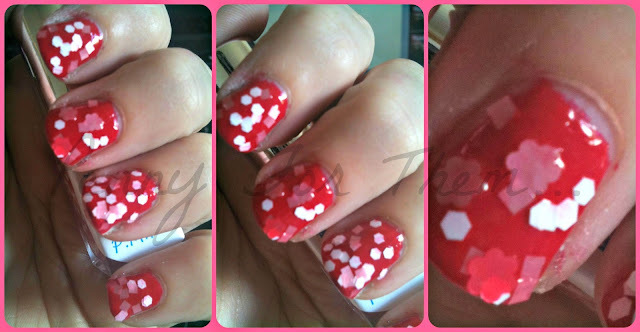 Some of you may remember the first review of the gorgeous glitters i did HERE. Well, Maker and Creator Charlie has released some more Glitter Babies and i swooped in and grabbed a few more! The great thing about these polishes is that you can use them on top of ANY other polish and they will transform it into a new polish. Who doesn't like that!! To team up these lovely glitters, i used a selection of Tara's Talons polishes (actually i won these ones, so i need to do a post to show you them in all their glory!!). Tara is also a UK Indie maker and these two brands compliment each other amazingly!! So, the mani's themselves - i used a base coat of Nails Inc Hyde Park, 2 coats of Taras Talons polish and then one coat of the PMP glitters. First up is PMP Glitterbabies "Pretty Woman" (part of the GlitterBabies Summer collection) over TarasTalons "Ice Lolly". A gorgeous mix of red and white circles and the occasional flower which looks really cute! Thought this looked great over the striking red base! Perfect for Summer! Next is PMP's "I Want Candy" over TarasTalons "Alphabetti Spaghetti". 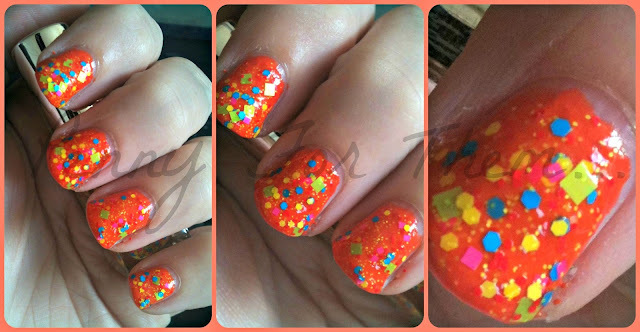 As the PMP were bright and neon colours, i went against my usual colour grain and picked the gorgeous bright orange! I love this combo! Really does POP out! another great combo as the blues really bounce of each other and the red glitter pieces add a nice splash of colour to them! I have to say, i have a soft spot for this one! Another of the new Summer Fun Collection. It's PMP's "Girls Just Want To Have Fun" over "Dolly". 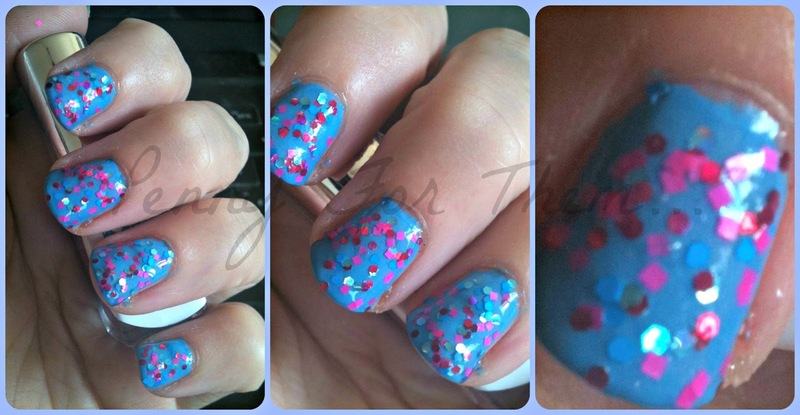 The pale pink really brings the multi sized multi coloured glitter to life. Last but no means least is another i have a soft spot for and is PMP's "Somewhere Beyond The Sea" over "Robots", and again from the new upcoming Summer Fun Collection. The glitter in this i love! love the colour of the pieces and i especially love the stars and crescent moon shapes! The base polish is a muted silver with almost a blue tint so it matches really well! 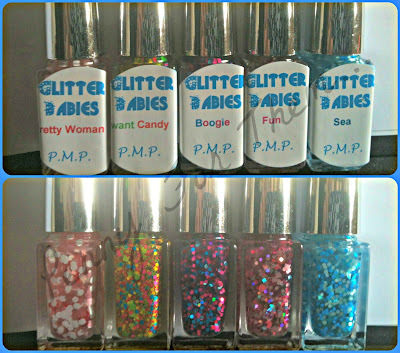 If you want to take a peek at PMP's gorgeous polishes theres a store you can visit which has also swatches and reviews on there for you to see too! You'll find gorgeous polishes on both pages, and supporting the UK Indie polish makers at the same time! Happy days! !